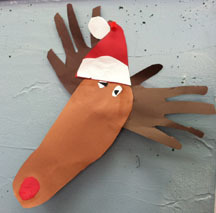 The kids in my son’s class made these cute reindeer for Christmas by tracing their feet and hands. They used construction paper, but you could also add a pom-pom nose, cotton ball Santa hat topper, googly eyes, and other fun elements. I think these are cute just the way they are! What You Need: Light brown, dark brown, white, black, and red construction paper; glue; pencil; safety scissors. How to Make It: Trace child’s foot on light brown construction paper and cut out. Trace child’s hands on dark brown construction paper and cut out. Draw nose, hat, hat fur, and eye parts on construction paper and cut out. Glue together. 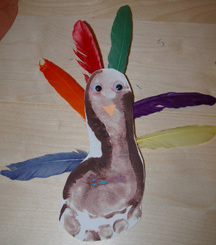 This is a quick, fun craft for preschoolers, and as a bonus you preserve their little feet at that age. Be sure to use washable tempera paint for easy cleanup. What You Need: black construction paper; white washable tempera paint; black tempera paint; small paintbrush. How You Make It: Set construction paper on floor. Paint child’s feet white. Have child stand on paper, keeping feet still. Then lift up child. If paper sticks, pull it straight off so it doesn’t smear. Wash feet. Once paint dries, use paintbrush to add eyes and mouth to ghost. You could also use googly eyes.